As automotive enthusiasts we tend to be drawn to various forms of mechanical beauty, whether that beauty is realized in the form of American muscle, European luxury, or Japanese hot hatches. Our senses are pleased by the hostile chopping lope of a cammed LS engine idling at a stop light or even when the sound of 9,000 RPM of Japanese aggression is heard ripping through the countryside. While we can appreciate many forms of automotive beauty, it’s exciting to meet people who dedicate their efforts to appreciate a particular niche. Recently I got to meet a father and son duo that have developed a complete obsession for Datsun Z cars and have spent years collecting various donor cars and parts in order to rejuvenate their collection. Enter the Z car yard. In the yard we find various generations of Z cars as well as various purposes for each car. Some cars will provide parts to other cars and some cars have been rescued to be brought back to life. It’s unfortunate when a car is left in a yard to die and Ray would not wish that upon any Z car, so when a deal comes up to rescue a Japanese legend, he does just that. Whether it’s through reincarnation or revitalization, Ray and his son Raymon have grown their roots in the Z community to better these Japanese icons that have been left to die. As I began walking the yard, I sensed an air of peacefulness; an air that everything was going to be okay for these cars. As Ray would tell me stories about how some of these cars came into his yard or the intent of the projects, it felt like these cars belonged here in an environment where they will not just be cast out into the elements to decompose. Tucked a little further back into the yard is this gem. This Shiro Special Z31 is one of only 1002 made available to the US market. Of course with a special edition car comes plenty of upgraded components, to include various up-rated suspension bits, a LSD, and Recaro seats, but there’s something else that this car has that no other Japanese car of the time had. It claimed the title as the fastest car from Japan in 1988 with a top speed of 153 MPH in a test done by Motor Trend. It’s interesting to see cars like this and hear the accompanying story. Bought from the original owner, this S130 chassis 280ZX had been retired, as was the owner, but the retirement for this car included a lack luster life of sitting idly, never to return to the country roads to be driven as Datsun had intended. Parts of this car have been gifted to this next car. While some may weep at the death of a car, it is the selfless act of sacrifice that is made for cars like these that is celebrated in the form of restoration. Youth is found once again in this beautiful example of a S130 280ZX. Without signs of aging or extensive modification, beauty is seen in this car as the designers originally intended. I think Mr. K would be proud to see this car living today, healthy and unmolested. One of the most iconic chassis produced under the Datsun name was the S30 chassis. Spanning across three cars, the 240Z, 260Z, and 280Z, this beautifully crafted Japanese sports car brought serious competition to the likes of American muscle and European sports cars in it’s day. 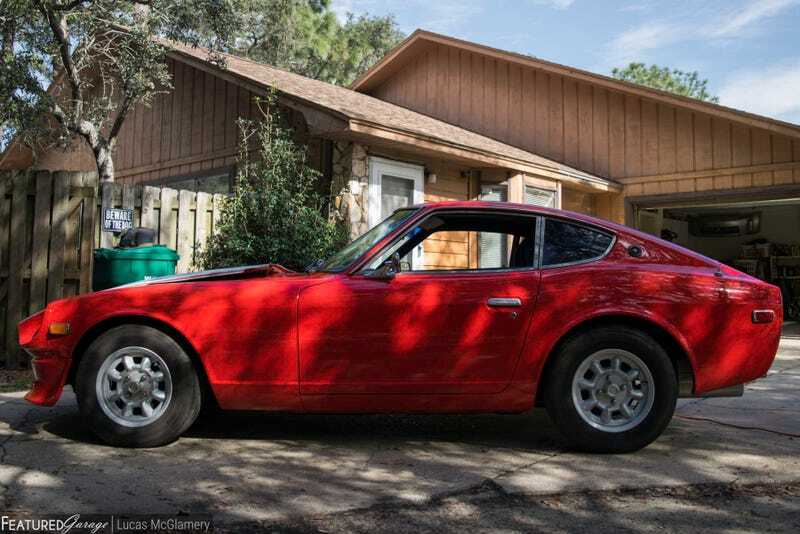 The 240Z shown above has certainly lived an eventful life in the hills of California and now Ray is in the process of restoring health to this veteran of a sports car. As a contrast to the factory looking S130 we saw previously, this S30 has been modified by the previous owner to suit their desires. Sporting various performance and visual upgrades, most notably the L28ET engine swap, this car had me standing before it in admiration, listening in my head to the sound track of the L28ET roaring through the California hills. The tires searching for grip as it meets the apex and powers through onto the next incline following a sweeper. Brakes are heating up now on the descent. Rolling on and off the throttle activates the smile inducing “pshhh” of the blow off valve. This car has been there. This car knows. And now we turn to this; a magnificent representation of the Datsun brand. Very rarely do I get to see S30s in my area and even more rarely do I get to see them at this level of beauty. When I saw the car, Raymon made note that the hood had been prepped for paint as it was a bit damaged when he received it. This did not bother me at all as there was just so much to admire about this car. So many of the styling cues within this car are what draw me to the brand; and I’m sure many other enthusiasts can relate with this. Beneath the bonnet lies the L28. The honest carbureted L series engines are part of what made the S30 so popular. Not only did the S30 have highly appreciable styling, but the smooth power delivery of the I-6 engine coupled with the raw sound of mechanical fuel delivery made for a proper driving experience. Imagine for a moment navigating your favorite road with this steering wheel linking you directly to the car; commanding it to maneuver the bends with your right food down. Up shifts are direct and make you feel like you too are a mechanical piece of the car as each gear clicks in. The visceral sound of the L28 announcing it’s presence to people from afar. This, a driver’s car, is just as awe inspiring today as was it’s predecessor, the 240Z, 46 years ago when it first quaked the competition. I’d really like to thank Ray and Raymon for giving me the opportunity to witness these machines. It’s heart warming to know that not all cars have to die, but instead they can return to their ranks in the automotive realm to continue driving and creating memories. After all, that is what cars are for; driving. For more articles about cars and things, click on over to featuredgarage.com. We don’t have any stupid ads to ruin your viewing experience.